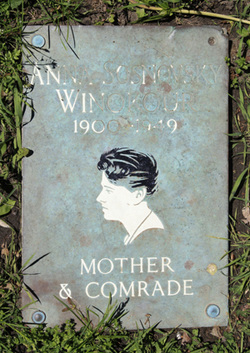 Anna Sosnovsky was born in the Ukraine, in a family of 5 siblings. She came to New York with her mother, aunt and three sisters. Her oldest sister was already in the U.S. with her husband and father. Anna was a bright and natural leader. On Aug. 21, 1918, Anna was part of a group of young anarchists protesting WWI. They threw leaflets (in English and Yiddish) out a NYC building window proclaiming such "outrageous things" as "there is only one enemy in the world and that is capitalism." The U.S. Supreme Court found them guilty of sedition and those they caught faced jail and deportation. Anna and her sister escaped New York and later Anna returned with a new last name. She became an organizer in New Jersey for the International Ladies Garment Workers Union ILGWU. Anna and Abraham Winokour met and became active in the defense of Sacco and Vanzetti, two anarchists who were arrested during the "Red Scare" of 1919-20 (and eventually wrongfully convicted and sentenced to death for their alleged role in a robbery and murder). In the spring of 1927, while pregnant with her first child, Anna took a cross-country fundraising tour. Her daughter Tisa, named after a combination of the last syllable of Vanzetti and the first of Sacco. Their second child was named Voltairine de Cleyre Winokour.